Since Spider-Man last encountered them, Electro has been seen criming in Daredevil #2; Sandman escaped from prison and was recaptured by the Human Torch in Strange Tales #115; and Kraven was knocked out by Iron Man in Tales of Suspense #58. The features section of this issue states that Midtown High School is "3 blocks west" of Peter Parker’s house. Our working assumption has been that Midtown High is Forest Hills High School, on 110th Street. Unfortunately, if you went three block east of Midtown High, you would end up in the lake in Flushing Meadows Park. We either have to move the school, or assume that “three blocks west” is a mistake. The best I can manage is to place the Parker residence somewhere around 19 68th Avenue, where the houses don’t seem to be a bad match for Ditko’s illustration. Peter's walk to school would then be three blocks east and two blocks north. Later continuity gave the address as 20 Ingram Street (a real address, currently occupied by a presumably rather bemused family called, er, Parker); but this is a 30 minute walk from the high school. Page 4: Flash Thompson tells Peter “you asked for it” and Peter replies “Now, there’s an imperishable bit of clever dialogue”… a rare occasion when Peter Parker allows himself to wisecrack in Spider-Man’s voice. Page 9: “Perhaps you should stay home today dear? It may be a touch of virus” Last time Spider-Man fought Doctor Octopus, an unspecified “virus” turned out to be the one thing that could remove his Spider-Powers. Page 13: The Human Torch uses firey skywriting to send a message to Spider-Man; a reference back to their first meeting when the message was “Spider-Man: Let’s Work Together”. All we can see of this message is “Spi.. Co.. F4”… perhaps “Spider-Man - Come to F4’s headquarters”? Page 20: “You can’t leave yet, Gunga Din” In Kipling’s poem, Gunga Din is a punjabi Indian, so it’s an odd name to apply to Kraven, a white African. Gunga Din is a noble figure (”you’re a better man than I am…”) where Spider-Man seems to despise Kraven more than some of his other foes. Thomas Dewey was an unsuccessful Republican presidential candidate, losing to Roosevelt in 1944 and Truman in 1948. He was also Governor of New York until 1954. The Chicago Tribune famously called the 1948 election result incorrectly, resulting in photos of Truman holding a newspaper with a “Dewey Elected” headline: this may be why he’s connected with absurd persistence. If Peter Parker was born in 1949, this wisecrack is roughly equivalent to one of today’s 17 year old crime fighters saying “I bet you’re still wearing a Vote for Bob Dole button”. We have stopped pretending that the voice of Spider-Man is anything other than the voice of Stan Lee. 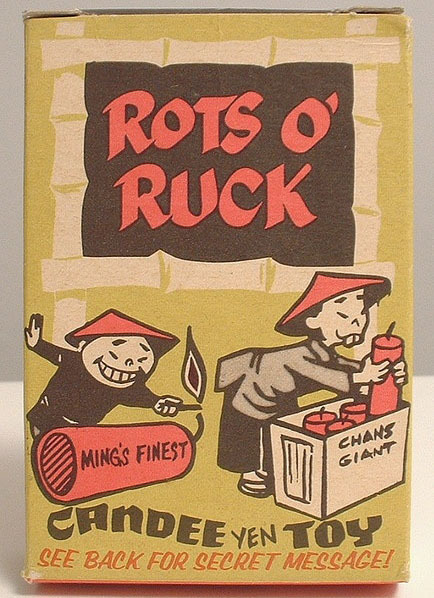 Page 22: “Rots of ruck” Facetious, borderline racist, cod-Asian pronunciation of "lots of luck". It may have been used as a shibboleth to identify Japanese combatants during the World War II. It was also the name of a popular tune and a brand of candy. Page 25: “Nice try, Mysterio. But did you forget that my Spider-sense enables me to find any enemy within reach, even I can’t see him.” Probably not: but he apparently has forgotten that he has a sonar device which blocks out our hero’s Spider-sense. 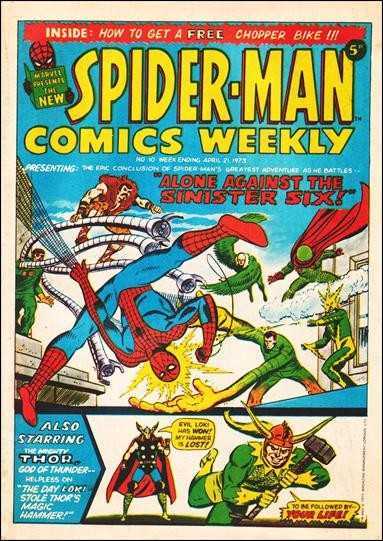 Page 26: “What in Sam Hill happened to Spider-Man?”. J.J.J is not above swearing in front of his staff (usually printed as "%*!#&&" or some such). But when he is alone in his room, he is not quite able to bring himself to say "hell". “I’ve waited a long time for this moment!” Indeed, Sandman has not been seen for more than twelve issues. 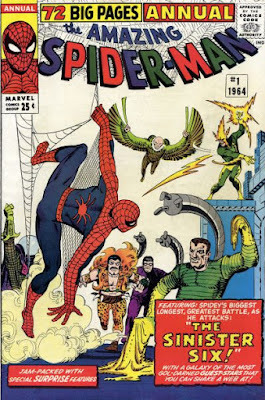 Page 33: "You know your friendly neighborhood Spider-Man is always available for weddings, barmitzvahs, and all sorts of fun things”… Confirmation, if confirmation were needed, of Peter Parker’s heritage: someone with a Christian background would have said "weddings, Christenings..."
Page 36: “Boy! What a movie serial this would make!! A new cliffhanger every minute! !” Stan Lee can’t resist lamp-shading his sources. Movie serials were long gone when Peter Parker was growing up (the 50s were the first golden age of TV) so once again this is Stan Lee's voice, not Peters. Page 39: “Spider-Man! Oh thank heavens! 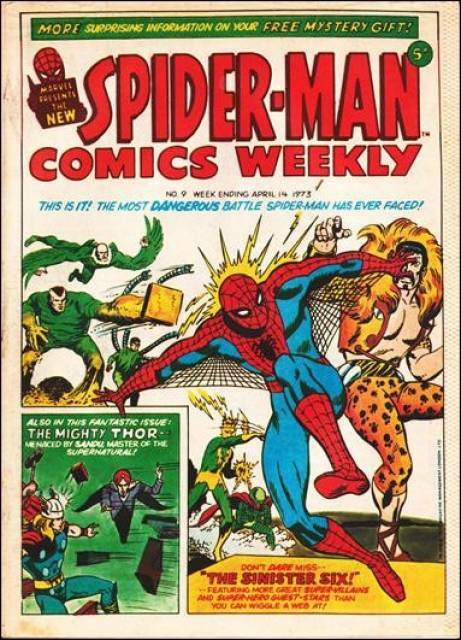 !” It’s only five issues since Betty Brant asserted that she couldn’t bear to ever see Spider-Man again. Page 40: “All shook up!” Elvis recorded a song of that title in 1957, so this is hardly a new piece of slang — if anything, Peter is being a little bit old-fashioned. “Do you realize we missed the Beverly Hillbillies” The Beverley Hillbillies was at this point the highest rated TV show in the US. 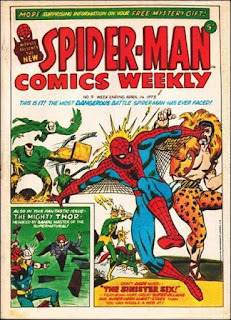 Season 2 ended in June 1964 and Season 3 began in the September of the same year, so when Amazing Spider-Man Annual #1 came out lots of Americans, like Aunt May, would have been eagerly anticipating its return. Page 3: When Thor whooshes past, Spider-Man’s “either he’s on his way to a meeting of the Avengers or he’s late for his barber…” becomes “Either he’s on his way to a Carpenters convention...” — presumably a reference to singer Richard Carpenters long(ish) hair, but possibly simply to Thor’s hammer. Page 10: The whole scene of Giant Man and the Wasp arresting the hoods is redrawn and replaced with one involving Mr Fantastic and the Invisible Girl (meaning that Sue uncharacteristically blames Reed for not paying him back for their phone calls). Page 12: Reed Richards calls up Major Talbot (from the Hulk) rather than Captain America. Page 13: The X-Men panel is removed altogether, panel 2 is moved to the left, and a new frame is added with Spider-Man saying “This is it Parker. No superpowers to back you up. You’ve got to do it all by yourself. I can’t kid myself. 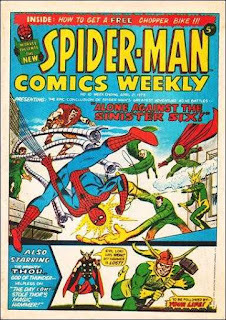 This could be my last battle.” Page 17: The Stark Electrical Building becomes the Decker Electrical building; Spider-Man is approached by a night-watchman, not Iron Man. Page 20: “Vote for Dewey button” becomes “Beatles Forever button.” (NOTE: We don’t call them buttons in the UK.) Oddly, “Why don’t you see a barber” becomes “Why don’t you see a veterinary surgeon”? This is the last page of SMCW # 9. Page 40: “Missed the Beverly Hillbillies” becomes “Missed the re-run of Love Story”. The features section of this issue states that Midtown High School is 3 blocks east of Peter Parker’s house. Our working assumption has been that Midtown High is Forest Hills High School, on 110th Street. Unfortunately, if you went three block west of Midtown High, you would end up in the lake in Flushing Meadows Park. Not according to Google Maps: Forest Hills High is south and west of Flushing Meadows Park, and three blocks west of it would be on 102nd Street. Sorry, I think I descended into incoherence by staring at a map and a comic at once. The page in the comics says "Midtown high school three blocks WEST" (of Aunt May's house). Ergo, Aunt May's house is three blocks EAST of the school. Which does, indeed, put us in a lake. Or possibly a tennis court, depending on how big a block is. Will correct. Glad someone is paying attention. I think look at this small stuff is interesting...partly because it's fun, but also because it occasionally makes me stumble on an "angle" which wouldn't otherwise have occurred to me. Yes, I am paying attention. I know how demoralising it can be to write a series of blog-posts to no apparent response -- I do assure you that you have readers, even if they don't comment as much as back before you turned comments off. If you pay too much attention, you may be asked to proof read / fact check the eventual book version! It’s only five issues since Betty Brant asserted that she couldn’t bare to ever see Spider-Man again. But apart from that, Mrs Lincoln...? We have stopped pretending that the voice of Spider-Man is anything other than the voice of Stan Lee. "You know your friendly neighborhood Spider-Man is always available for weddings, barmitzvahs, and all sorts of fun things”… Confirmation, if confirmation were needed, of Peter Parker’s heritage: someone with a Christian background would have said "weddings, Christenings..."
...once again this is Stan Lee's voice, not Peters.